^ Peterson, Merrill (1975). Thomas Jefferson. pp. 627. Annals of the Congress of the United States. Washington, D.C.: Gales and Seaton. (1834?1856). pp. 10:1028?1033. http://memory.loc.gov/ammem/amlaw/lwac.html. Doron Ben-Atar and Barbara B. Oberg, eds., ed (1999). Federalists Reconsidered. Jeffrey L. Pasley, et al., eds., ed (2004). Beyond the Founders: New Approaches to the Political History of the Early American Republic. Beard, Charles A. (1915). 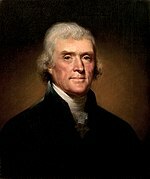 The Economic Origins of Jeffersonian Democracy. Bowling, Kenneth R.; Donald R. Kennon (2005). Establishing Congress : The Removal to Washington, D.C., and the Election of 1800. Buel, Richard (1972). Securing the Revolution: Ideology in American Politics, 1789-1815. Chambers, William Nisbet (1963). Political Parties in a New Nation: The American Experience, 1776-1809. Dunn, Susan (2004). The Election Crisis of 1800 and the Triumph of Republicanism. Elkins, Stanley; Eric McKitrick (1995). The Age of Federalism. Freeman, Joanne B. (1999). “The election of 1800: a study in the logic of political change”. Yale Law Journal 108 (8): 1959-1994. Goodman, Paul (1967). “The First American Party System”. In William Nisbet Chambers and Walter Dean Burnham, eds.. The American Party Systems: Stages of Political Development. pp. 56-89. Hofstadter, Richard (1970). The Idea of a Party System. Horn, James P. P.; Jan Ellen Lewis, Peter S. Onuf (2002). The Revolution of 1800: Democracy, Race, and the New Republic. Miller, John C. (1959). Alexander Hamilton: Portrait in Paradox. Schachner, Nathan (1961). Aaron Burr: A Biography. Sharp, James Roger (1993). American Politics in the Early Republic: The New Nation in Crisis.